December has been a horrible month as far as cycling has been concerned. 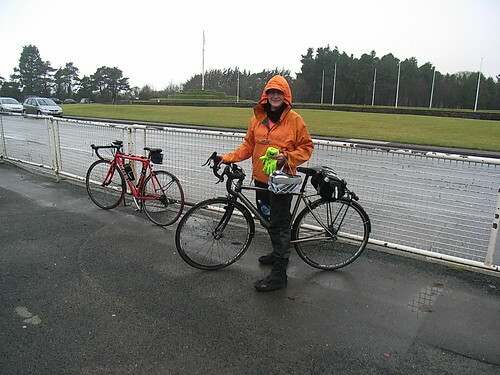 My last Audax ride was on the 12th of December and that was the very last day I rode my bicycle... not like me at all. I think I had Chris's virus. It started off with what I can only describe as slight flu symptoms which worstened to the point where I ended up having 2 days off work to recover. I did indeed get better, and then several days later ... wham, I came down with the heaviest cold I think I have ever had in my entire life. It went on and on and on. Only good thing, to say about it, is that the weather became very icy and cold ending up the island getting about a foot of snow in one morning which stayed up until Christmas day. As I was unable to cycle, I just had to make the best of it. (Ive gained 6 pounds due to illness, no cycling and Christmas of course). I have mentioned briefly before somewhere on this blog, that I purchased a second hand Dolan road bike, this was to 'replace' my Hetchins for winter cycling, to prevent salt and road crud damaging my fabulous frame. Sadly, I never got along with it. It was far too low at the front, even when I used a riser stem, and very long at the front, and I found steering twitchy to say the least. It was simply dangerous for me to do my 'lifesaver' look over my right shoulder, take my hand off the handlebars to signal right... Simply didnt feel safe. The reach was far too long for me, and when the brake pads wore down I seriously struggled to get enough strength in my hands to pull the brake levers back enough for them to properly engage. It was much worse in the wet, which is the reason for buying a winter bike in the first place. My Hetchins is snug as a bear in hibernation right now. I don't want any salt and road grit fouling up my life long bike, and so the Hetchins is away until March or April when hopefully the worst weather will have abaited by. I wondered what to do... Should I persevere, but then I nearly had an accident, when I simply couldnt stop – by luck there was no traffic coming, but the Dolan and I sailed across a busy road, it was a worrying moment. In the end, after riding my heavy tourer for weeks, I managed to get a new road bike from Enigma. The bike I chose was an Enigma Etape, and at some point I will do like Chris has for his bike, write a review on it, in fact I might do a comparison with it and the Hetchins. 🙂 It is such a comfortable bike to ride, and it copes VERY well with the wet weather and all that road crud. I felt I was back on a light fast racer again as I have been on my tourer bike since the clocks went back which is HARD slog, other than the brief few weeks on the Dolan (were we hated one another!). Today was fantastic. I felt ace too. I rode an Audax on the 12th Dec on the Enigma but I felt dreadful and the bike felt like lead, but it was nothing to do with the cycle as it happened, as I was brewing the heaviest cold I have ever had, that simply brought me and my lungs to my knees over the coming few weeks, and I was glad to see ice and snow, as it doubled my reasoning for not cycling. Today was the last of my Christmas holidays, and I eagerly got up early to get out there, only to be faced with rain and thick fog. Still, not to be put off. Tina set off from Ramsey at 9am and was at my cottage by 10ish. A quick coffee break and off we went. Initially we were to cycle south, climb the Sloc and then cycle north to Ramsey, where we would part company and I would cycle back home. It didnt work out that way, the forecast said the best weather was west of the island and north, so we took a detour to St Johns for coffee before heading north to Ramsey. Here is my Garmin history of today. It was great to catch up with Tina again and to cycle out and about. The ride its self was uneventful but fun of course. Best of all, it rained! It wasn't cold either. And this has given me an opportunity to give a brief review of my wet weather gear. It was amazing how warm the weather felt today, I think the temperature got to about 7degrees, funny, how after all the ice and snow that fog, rain and 7 degrees felt like a good day! After reading Patricks review of Paramo water proof jackets some time ago, I bought a ladies light weight Velez smock in a fantastic foxglove (purple to you and I) colour. It was wonderful. And for the first time, the jacket really did what the label said – kept me dry, bone dry all summer long, and despite some monsoon conditions, not once did I get even slightly damp inside it. One of the best things with this jacket, is that you can simply wear nothing beneath it if you wish, and it will not feel horrible and cold against your skin. 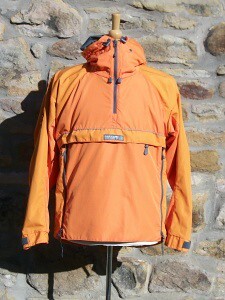 I always rode in summer, with a light top and in rain, added the Velez smock. If the weather was a bit chilly, it made out like a comfortable sweater as well. So when the lightweight Velez started to feel chilly, I invested in a heavier Velez. The problem with purple too, was that it isnt very hi viz and I am a fan of hi viz. So I looked for a brighter winter colour and found this Paramo jacket – another Velez and in Orange, they also do them in lime green too (plus other more grungy colours, but I was looking for bright). Its the right colour, the right weight, and today, it rained all day long. When Tina and I parted company, the heavens opened for the final 14 miles of my return journey in darkness, and fog and pouring rain and the jacket still kept me dry. To prevent over-heating, I wore a thin merino base layer and a summer weight cycle top. I didn't over heat, even though the ride home takes you over a very steep incline for several miles leaving Ramsey. I cannot fault this jacket. The hood has a peak and the hood fits nicely under my cycle helmet, and helps keep the driving rain out of my eyes as well. I am wearing it in my photograph of me on the Enigma bike. As, I was so impressed with the Paramo Velez jackets, in October, I also purchased a pair of ladies light Velez waterproof trousers and I have pretty much worn these daily on my commute to work, and I had them on today as well. Not very exciting to look at, but once more, they do what the label says they do... they keep you 100% dry! They are simply brilliant. OK, they are not your typical cycling trousers and were never designed to be so either, infact they are walking trousers. I wear these on my bike with my usual cycling shorts beneath as there is no saddle padding of course and nothing else. The fabric is warm to the touch and even on a cold icy day, the fabric does not chill your flesh. The legs are generous over the knee and do not therefore get tight or constrict the knee movement. At the hem, they have velcro strapping to tighten the trouser round the ankle – this helps to prevent them getting into your front ring. But to be sure of this, I also wear them with water proof over shoes wrapped tight to keep them from flapping too much, but to be honest, I dont think this is necessary, just me being over cautious. Should you get too hot in them (I have not so far this winter), you can unzip the thigh to the knee if you feel the need to. The only little gripe I have, is that they have a fly zip, and I think this will wear out before anything else, as they are quite durable (although I would not put them on for mountain bike riding, as I think they would tear if I rode past thorns and gorse). So a BIG THUMBS up for Paramo. Brilliant gear. A fabulous ride out, in foul weather made better by good company, and good clothing! Posted by Mary on December 29th, 2010. I've a Paramo coat for at least 10 years and it still looks like new. 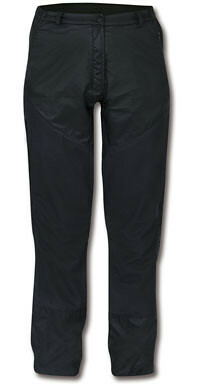 It's very bulky so you couldn't take it touring but it's waterproof and ultra-breathable. Whoa! That's some winter trainer. I got my Kinesis because it's an aluminium frame and I was still smarting after examining all the rust on my touring bike's Reynolds 531 frame. I'm looking forward to reading about your new titanium bike. Mary wrote: I think the temperature got to about 7degrees, funny, how after all the ice and snow that fog, rain and 7 degrees felt like a good day! The right bike and the right clothes: could we ask for anything more? Your blog (or a couple of glasses of port) reminds me that I spent a weekend cycling on the Isle of Man in, good grief, 1977. My diary notes that Douglas then allegedly had three "sleazy holes"; two being the Mermaid and the Empress. 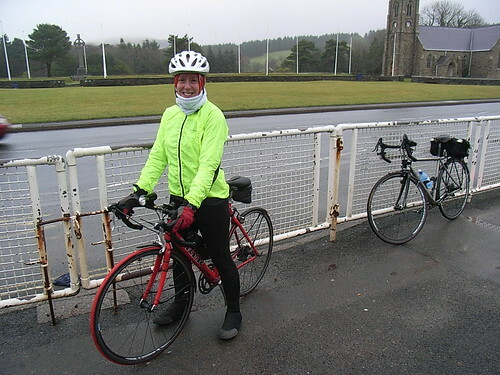 I don't know what we did on Saturday, but on Sunday we cycled to "The Miners" pub in Laxey. Do these places still exist? "Whoa! That's some winter trainer"
Lovely bike Mary. Enjoy it. Winter cycling is why I bought my alu-framed hybrid a few months ago and I'm very pleased with it. Like your Hetchins, my Ridgeback is tucked up until Spring (next to the bed in fact). The hood has a peak and the hood fits nicely under my cycle helmet. The hood on my Paramo Quito jacket goes right over mine. The hoods on Paramos are an excellent feature. A titanium bike is a great idea for the winter. As Patrick says, enjoy it. Selling your car must justify unlimited cycling expenditure and a bike is the only thing that can actually pay for itself. Good to hear that your Enigma is such a good fit – getting a comfortable bike fit is much more difficult for women. I'm a bit spoilt here. The weather doesn't tend to get too cold (or at least it didn't used to, I've been snowed in 3 times in the last 12 months!) so the council doesn't bother much with salt. Riding my pride and joy all winter can sometimes involve almost as much time cleaning as riding though! You and Patrick are definitely convincing me that Paramo is the way to go. Snag is I already have an extensive collection of rainwear, IOW isn't generally too wet and Paramo is pretty pricy. There is a seller called 'Paramo Seconds' on ebay and I'm hoping eventually to find something in the right size/style/colour. There is a Quito in the right size at the moment but its Forest Green and I don't think blending in with the hedge is a good idea for cycle rainwear! Not a speck of snow, not a speck of snow (sniff) ... temperatures have gone up to 9 degrees here today, the river has opened up again and the trail has gone soft. No cycling in this weather, or for the next 3 months for that matter. They say cross country skiing is good cross-training for cyclists, but snow shoeing is the only practical option on a day like today. Happy New Year! 9 degrees here too. After quite a layoff I've managed about 60 miles in the last couple of days. Three months without cycling... I'd be trying some studded tyres I think. They work apparently. I might get some for the next snow.